Fanatics is an upcoming girl group from FENT consisting of Rensika, Doah, Chiayi, Yoonhye, SangAh, and Hyewon. 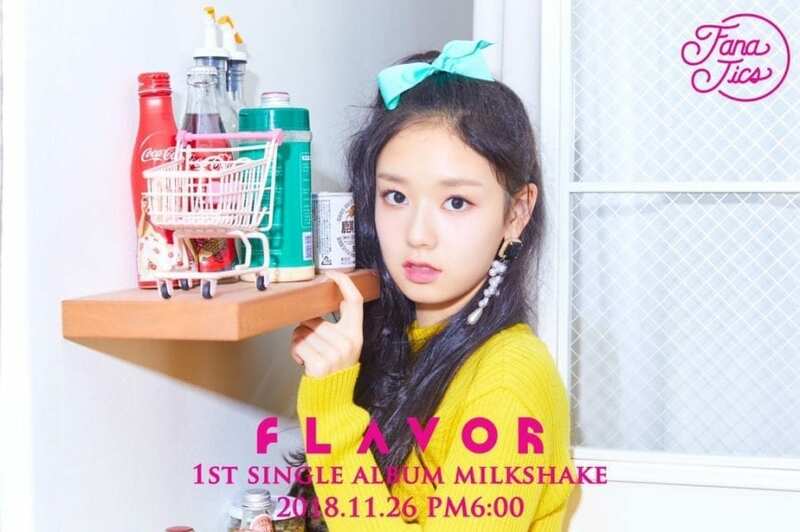 Fanatics debuted its first subunit, Flavor, on November 26 2018, consisting of Doah, Chiayi, and Yoonhye. -She is half Japanese and half Chinese. -She grew up in Dalian, China. -Yoonhye and Sika are former JYP trainees. 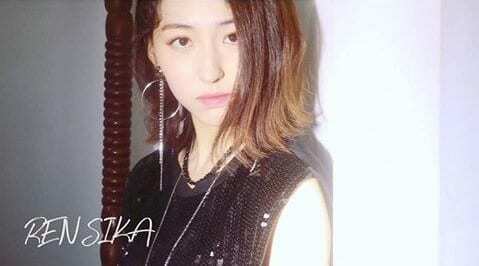 Sika was the Japan Team leader at JYP and trained closely with Twice’s Sana, Momo, and Mina, and she was the first Japan Team member to leave JYP. -Chiayi used to have braces. -She looks like a deer. -Her favorite foods are: ice cream, jokbal, chocolate, vegetables, carrot cake, sweet potato, and cheese tteokbokki. -Favorite flavors: Cheese, sweet and chocolate flavors. -Her hobbies are cooking, exercising, and photography. -She wants to visit Japan, the US, and Europe. -Her favorite colors are pink and purple. -Yoonhye and Rensika are former JYP trainees. -Yoonhye is the leader of the Flavor subunit. -Her favorite color is red. -She dislikes ghosts and worms. -If she have free time, she wants to take time being alone or play with her friends. -Favorite flavors: Cheese and everything that has a cool taste. -She wants to visit Japan and Maldives. -Doah competed on Produce 48 (ranked 23rd). -Doah is known to look like Kim Sohye. -Her nickname on Produce 48 was Ribbon Girl. -She is close with Kim Nayoung of Banana Culture. They even joked about getting pizza together after being eliminated. -Doah attends SOPA along with IZONE‘s Yujin and Fromis_9‘s Jiheon. Doah will be in the music department. -Her Hogwarts house is Slytherin. -She is a fan of Krystal from f(x). 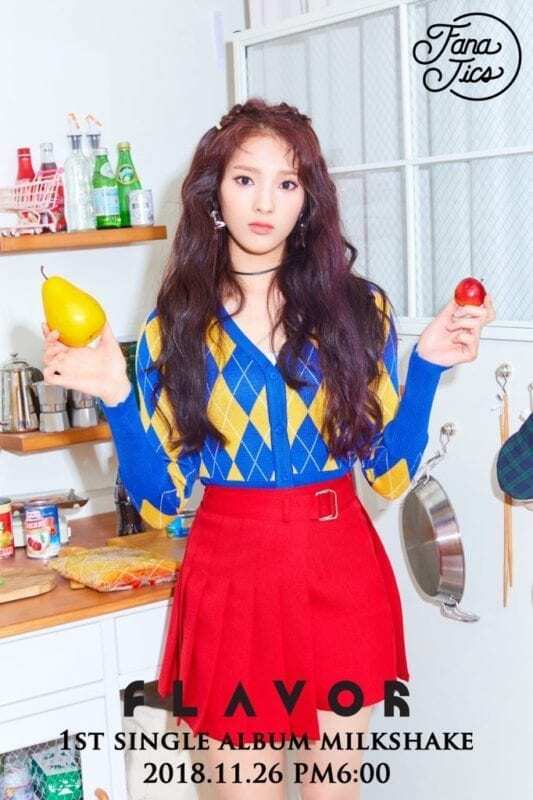 -Her favorite foods are rice cakes, green tea, and cherries. -Her favorite colors are magenta and gray. -She likes to listen to ASMR and disco music. -She is allergic to cat hair. -If she have free time, she will sleep, rest, eat and do healing time. 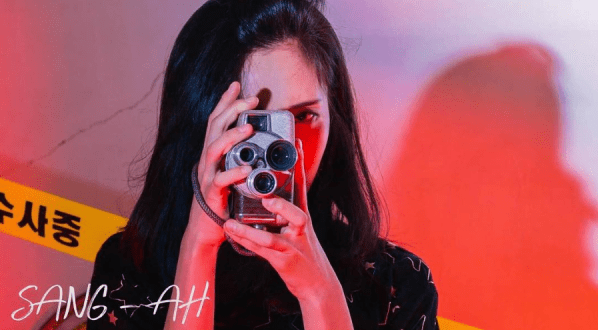 -She wants to visit Hong Kong and U.S.A.
-Her role model is Krystal Jung. Who is your Fanatics bias? -Doah nickname is Ribbon girl while in produce. 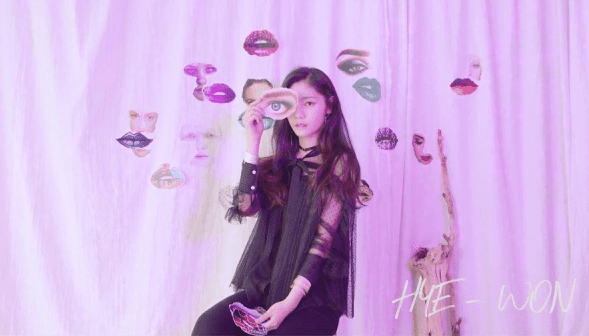 -She the only one who always received benefits form group battle to position battle and concepts evoulution in produce48. (For example like OHH-AHH(win/1000 bonus), Ddu du Ddu du (Number 1 in team/5000 bonus) and Rollin’ Rollin’ (No 1). -Doah close to Kim Nayoung form produce48/Banana Culture trainee. 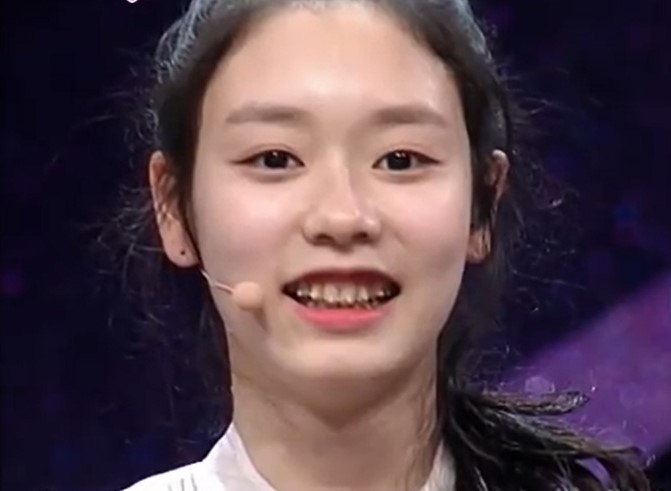 in 2019 Doah will Enroll at SOPA high School along side IZONE Ahn Yujin and Fromis_9 Jiheon and she Choose Music Department. 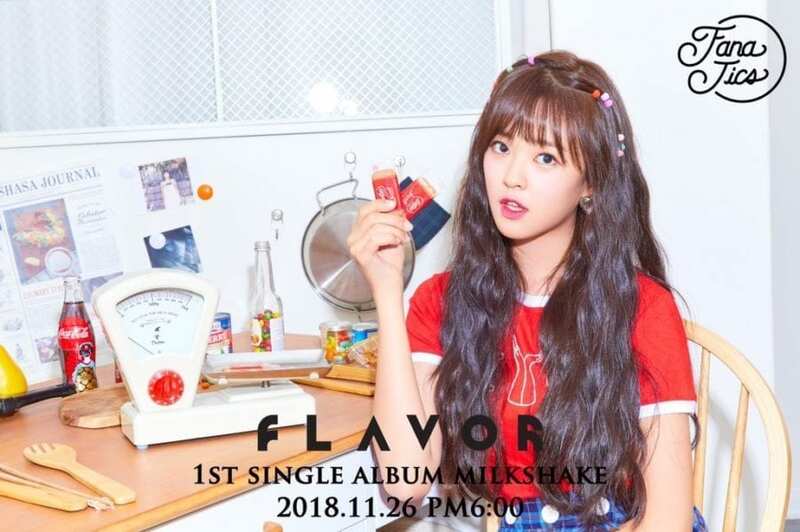 Please update the profile intro and state that Flavor debuted on November 26 2018. Chiayi is also a dancer; she centered the dance break in Milkshake. 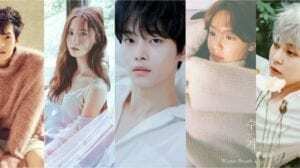 When Hyewon, Sangah, and Rensika are going to debut? It’s probably safe to assume they’ll debut in early 2019, either as another sub-unit first a la Loona or as a full group together with Flavor. 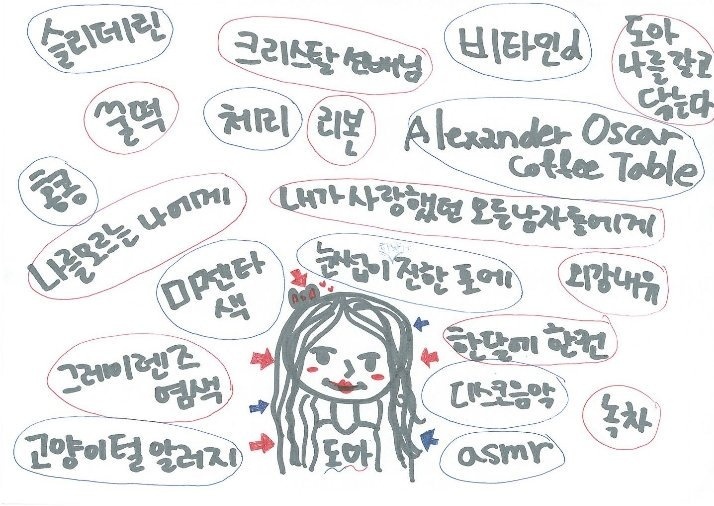 There’re 2 points under Doah’s profile abt her attending SOPA’s music department, I think they can be merged. Sub unit of other 3? 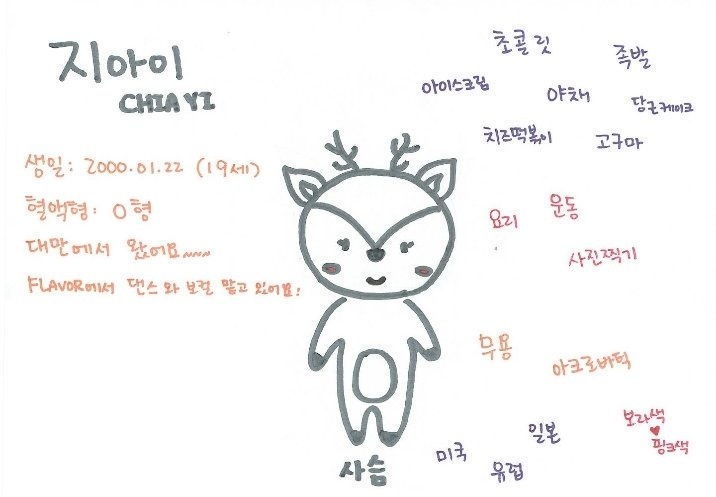 – She said she looked like a deer so she drew a deer on her TMI. – Countries she wants to visit: Japan, United States and Europe. – Favorite colors: Pink and purple. Probably debuting in early 2019, either as their own sub-unit a la LOONA or tgt with FLAVOR as the full 6-mmbr group. But where did you find that her real name is Li Jiayi not Li Chiayi? On their official accounts? Cause I couldn’t find it. on her kprofile if you look at her name you’ll see the 李 嘉義 and that translates to li jiayi. Thank you for answering me! Doah is 165 cm tall, Chiayi is 166 cm tall and Yoonhye is 173 cm tall.